A simplified roofline creates interest with thoughtfully placed gable accents. Tapered columns highlight the front porch and welcome guests to the sidelight framed entry. Inside, the floor plan is equally thoughtful, with a spacious great room, open kitchen with island, and single dining space. The master suite is expansive with dual walk-in closets and a bathroom comfortably suited for two. Additional features include a walk-in pantry, oversized utility room, three-car garage, and an inviting screened porch with cathedral ceiling, skylights, and a fireplace. Two additional bedrooms and a study round-out this classic design. 1st Floor: 2239 Sq. Ft. 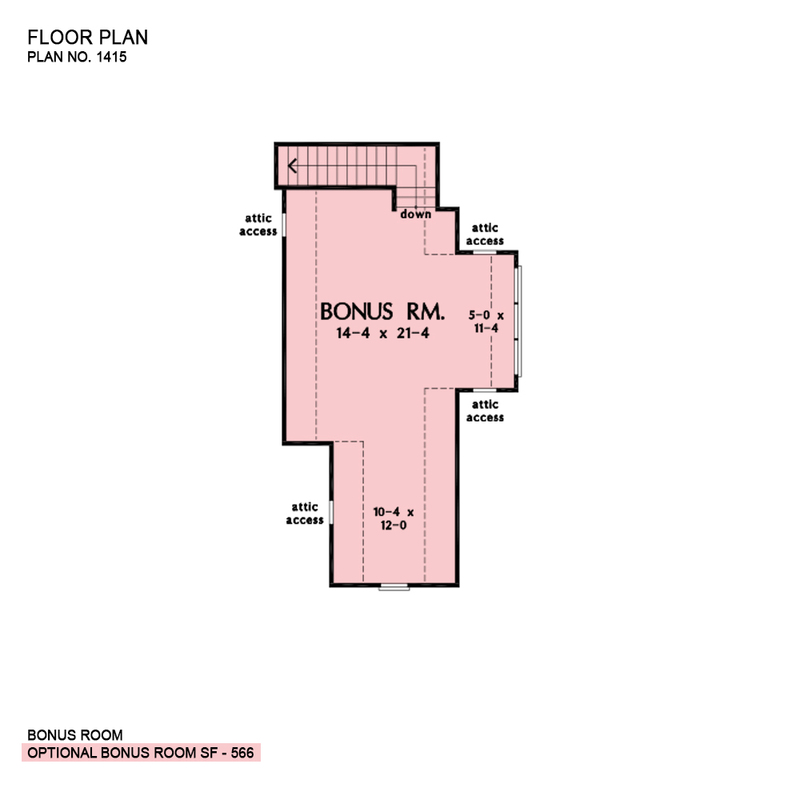 Bonus Room: 566 Sq. Ft.
Porch - Front: 222 Sq. Ft.
Porch - Rear: 110 Sq. Ft.
Porch - Right: 46 Sq. Ft.
House Dimensions: 69' 0" x 81' 6"
Foyer (Tray): 7' 4" x 10' 0" x 10' 9"
Dining Room (Tray): 13' 0" x 12' 8" x 10' 6"
Great Room (Coffered): 16' 8" x 18' 8" x 11' 0"
Kitchen (Flat): 13' 0" x 11' 4" x 9' 0"
Utility Room (Flat): 7' 4" x 10' 0" x 9' 0"
Bonus Room (Clipped): 14' 4" x 21' 4" x 8' 0"
Garage (Flat): 24' 4" x 21' 4" x 0' 0"
Garage Storage (Flat): 9' 4" x 1' 10" x 0' 0"
Master Bedroom (Tray): 13' 4" x 15' 0" x 10' 6"
Bedroom / Study (Coffered): 11' 8" x 12' 0" x 10' 9"
Bedroom #3 (Flat): 11' 8" x 12' 4" x 9' 0"
Bedroom #4 (Flat): 12' 4" x 11' 8" x 9' 0"
Porch - Front (Flat): 27' 8" x 7' 4" x 10' 0"
Porch - Rear (Flat): 15' 8" x 7' 0" x 9' 0"
Porch - Right (Flat): 6' 0" x 7' 8" x 9' 0"
Deck / Patio (None): 30' 8" x 14' 10" x 0' 0"
Porch - Screen (Cathedral): 12' 0" x 12' 0" x 13' 0"